Fell in love with this rustic Italian olive bowl. 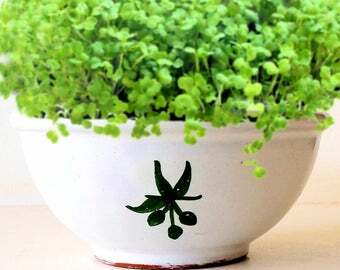 Such a pretty planter for your microgreens garden! 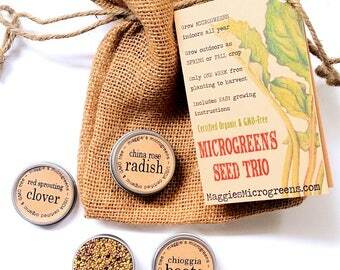 My newest gift kit - a trio of microgreens seeds (choose any 3 you like) in a ready-to-go gift bag! Only 4 days after planting! Near instant gratification, lol. I love this vintage Ikaros Pottery mug (handmade in Greece circa 1955-1960), ️ the leaping stags on the turquoise background! My Nemo *loves* his fresh cat grasses kit! New in my shop: gift wrapping! Makes the perfect present even more perfect. A classic, modern shaped gray & white rustic patterned rice bowl is perfect for a mini-garden of microgreens. My first-ever Maggie's Microgreens sale ends tonight at midnight ... there is still time to save some green! Move your garden indoors and save some green! Time to take your garden indoors? They're baaaack ... all 3 colors of Sugar Skull Microgreens kits are back in stock! Love this vintage "carrot" cream pitcher! 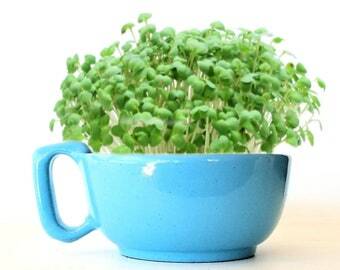 How perfect for a mini garden of microgreens, for your Spring or Easter tablescape?